HAVE YOUR OWN LOGO, BADGE, COAT OF ARMS ETC. DISPLAYED IN A MOST PROFESSIONAL WAY! Order your FREE no-obligation colour visual today! For further information please choose a related catagory from the left menu, otherwise click here. Awards, Trophies, Promotional, Presentation etc. 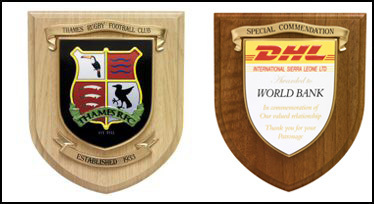 As manufacturers and suppliers of distinctive Shields/Wall Plaques since 1994 we at Rowan Displays have established a long line of satisfied customers from around the world who appreciate the unique quality of our products and services. Shields/Wall Plaques can be produced for any organization, club, company etc, and are used for many different purposes such as Promotional Campaigns, Awards, Presentations, Trophies and Gifts etc. Prices from £13.95 each depending on quantity ordered. Listed to the left are the general areas we are currently supplying to, please click on the appropriate link to view related examples of our work, and to find helpful information on how to proceed with your enquiry. Shields/Wall Plaques can often be referred to as Heraldic Shields. The word Heraldic is more commonly used when referring to a coat of arms which has a historical background, typical examples would include Universities, Colleges, Councils, and Schools etc. 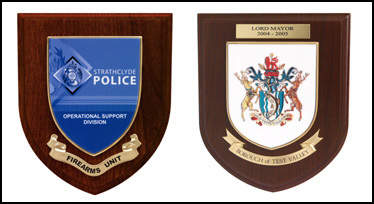 In many cases Shields/Wall Plaques are used to display a logo/badge, which would often apply to Companies/Sports Clubs etc, if required even just text alone can be displayed. For Family Crests, Scottish Clans/Irish Clans please click the appropriate button on the left.